What could've been a fascinating fly-on-the-wall document of the creation of one of John Cale's lesser-known albums is trivialized due to the continual absence of proper context and forced drama. It's hard not to feel somewhat cheated by Words for the Dying. Rob Nilsson's documentary seems simple at first: in 1989, John Cale and Brian Eno set out to record "the Falkland Suite", which is John Cale's neo-classical composition dedicated to the works of poet Dylan Thomas. What Nilsson and crew discover, however, is that Eno -- who was brought in to produce the project -- absolutely despises being filmed, something which he expresses by either hiding from/flipping off the camera, and sometimes simply demanding that the crew be out of his way when producing. He's very standoffish, but, unfortunately, this tension is capitalized on, and it soon becomes the dramatic crux for the entire film. Songs for the Dying still bristles with the excitement of seeing two music legends work together, but what could've been a fascinating fly-on-the-wall document of the creation of one of Cale's lesser-known albums is by and large trivialized due to the continual absence of proper context and forced drama. When the camera crew arrives in Moscow to watch Cale and Eno work with a full orchestra, we know simply that they're hammering out details with the conductor about what will make the performances exciting, all while the viewer is left in the dark about the fact that Cale actually composed this entire orchestral work himself. Though the words of Thomas aren't recorded until later, we are never given a full-bodied explanation of why Cale is attracted to the poet's works so strongly, much less why he decided to do an entire album based on them. Due to Eno's reticence to appear on screen, the camera crew instead follows Cale as he goes to his hotel, sees a local rock band, and has discussions with many commonfolk. It is here that the film is given a chance to at least explore the cultural divides that separate Cale's largely American music aesthetic from that of a foreign land's, but the only time this is explored is when Cale notes how the local rock band he sees has a very "American" sound, to which the singer responds how that disappoints him, as he feels that the band has a very Russian sound. Though it's an interesting point that's brought up, the film, again, doesn't bother exploring this topic, instead jumping back to Eno and Cale and their frustration with the orchestra (and the conductor getting noticeably frustrated with the accordion player). 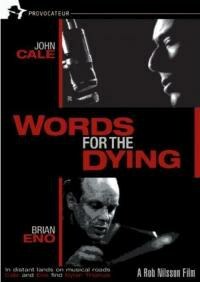 The worst aspect of Words of the Dying is how the film's last portion -- following Cale's frustrating sessions recording his vocals (to which Eno proves most active towards helping) -- is essentially a road movie following Cale to meet his mother in Wales and getting her to sign a document in regards to her house. Again, the context of this -- much less how it pertains to the album -- is completely absent, the documentary slowly morphing from a behind-the-scenes look at music creation to a personality piece on Cale, an argument that's bolstered by interviews with the likes of Cale's wife and random Russian locals who note how influential the Velvet Underground was outside of America (no such mention is given to Roxy Music, you'll note). There are still moments of genuine chemistry, however; most of which are when Cale and Eno are working together, often through the perspective of a surveillance camera. In once such sequence, Cale sits at the piano and composes a piece that is later titled "The Year of the Patriot", a simple yet affecting piano meditation that is later adorned with an erratic cello recording. To see Cale write and play, Eno observing and refining the whole time through...this is what is exciting, as we get to see how the duo's relationship works, and just how incredibly precise they can get over simple chord changes and the like. They share frustrations during the vocal recording process as well, but the important thing is that they share them together, their own respective senses of professionalism keeping each grueling session afloat. Just when things are getting interesting, however, the camera slowly drifts back to a shot of Eno's face, followed by Eno covering up his own face or getting frustrated, it now feeling like the crew is deliberately provoking the superstar producer into some sort of reaction (and the self-serving retrospective interview with Eno some time later just feels tacked on). The only reason that Words for the Dying bears any sort of entertainment value is simply because Cale is so accommodating and his music is so utterly fascinating. It's hard not to watch this film and then immediately go and purchase the resulting album after -- the modern orchestral suites are complex yet poppy, accessible without being pandering. Cale never rushes to the filmmaker's defense when Eno is angered, nor does he do the same when the tables are turned. Cale remains a neutral party, but he's more than happy to have a couple of cameras document this passion project of his -- it's just a shame that it's documented so poorly.